Synopsis (from Goodreads): Sometimes Lily has to say goodbye to her Daddy for about a billion days. She feels a swirl of unhappy emotions that can be scary. And she aches to feel connected to her Daddy during his long deployments. Join Lily as she learns how to cope with her emotions and to be happy in her daily life while she looks forward to joyfully saying hello when Daddy gets home. 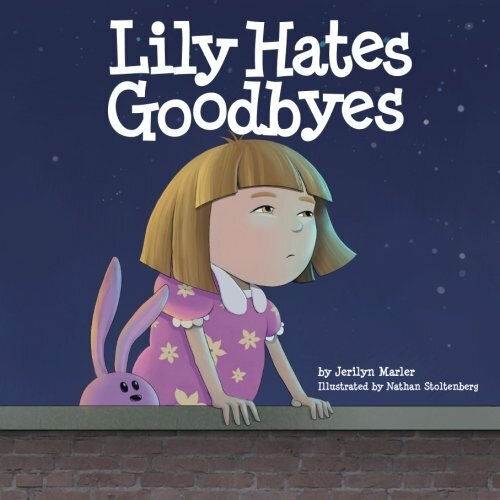 "Lily Hates Goodbyes" is helpful for any child who suffers separations from a loved one. The charming illustrations will draw your child's interest immediately. Children appreciate the affirmation that scary emotions are normal and that they don't last forever. Parents appreciate the opportunity talk with their children about the scary emotions in a safe, non-volatile way. The author's suggestions at the back of the book provide guidance on how to use the book to help children understand and cope with what they're going through. I wrote this story for my four-year-old granddaughter who was reeling from the pain of her Daddy's time away in the Navy. She was deep in denial about the scary feelings, yet her behavior clearly showed that she was in turmoil. She would run from the room instead of talk about feelings. So I wrote the book to give us a "third person" to talk about. Book Lily was mad. Book Lily was sad. Suddenly it wasn't so scary for Real Lily to talk about those feelings. She asked me to read the book to her over and over. She even wanted me to sing it to her. The result is what I hoped for: Lily's more at ease with her emotions, knows what she can do when she feels them, knows that it's safe to say whatever she feels, knows that her Mommy will be there steadfastly and lovingly by her side through it all, and that there is a joyful reunion coming with her Daddy. I fervently hope that this book will help your child through the long, difficult separations, too. My Thoughts: This was a great little story to help children deal with their feelings when their parent is gone. Lily's daddy is in the military however the message can work for any parent that is gone for an extended time. My husband is a cop and there are times when he goes away for trainings. I read this book to my kids (ages 8, 5, 3) and they immediatley connected to little Lily. I loved the idea of the "Daddy Memory Box" that Lily put pictures and stuff in for her daddy when he came home. It was a great idea and my kids immediatley took to it. I thought the way that the book dealt with Lily's feelings, as well as her mommy's feelings, was great. It was nice to read a book that says it's okay to be mad about your circumstances sometimes but you have to keep going too. All in all, I think this is a very inspiring, wonderful book for children who have parents that are sent away for an extended period of time. It helps kids understand that they aren't the only ones who have hard feelings to deal with and it's okay to be mad sometimes.